The RLX8 is an 8-relay board that can be driven off 8 standard NPN transistor outputs. The relays are rated up to 5A at up to 240VAC (resistive load). The relay contacts are brought out to screw terminal blocks. 2 relays are brought out as independent SPDT (form C) changeover contacts. The remaining 6 are brought out in two groups of 3 SPST (form A) normally open contacts with a shared common in each group. Each relay coil has its own voltage regulator, so the board can operate with supply voltages between 12VDC and 24VDC without risk of overheating the relay coils. 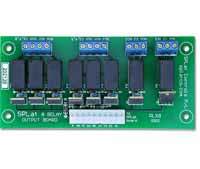 The board is compatible with all SPLat controllers which have ground switching (NPN) transistor outputs. Developer's kit, contains the adapter board with 8 relays, 300mm connecting cable, matching connectors and mounting standoffs. Adapter board with 8 relays, matching connectors and mounting standoffs.